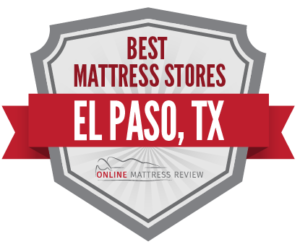 Looking for the best mattress stores near El Paso, Texas? We’ve put together this guide to help you out. Waking up stiff, sore and grouchy? A 2006 study at Oklahoma State University found that subjects who switched from their old mattress to a new medium to firm mattress reported significantly more restful sleep, and relief from back and neck pain. The Better Sleep Research Council recommends replacing your mattress every 7-10 years, and more frequently in the case of sleep problems. If you’re overdue for an upgrade, you’re probably wondering where to buy a mattress in El Paso for the best quality, value and convenience. Not to worry- we’ve scoured the listings and reviews to bring you the best mattress stores in El Paso, all grouped by region. Some deliver value, others focus on luxury or high-tech specialty beds. No matter your preference or neighborhood, we’ve got you covered. Read up and get started on finding the fresh, new mattress that will be your personal ticket to a more restful and restorative night’s sleep. The overall scene for mattress shops in El Paso is dominated by big chains like Mattress Firm and American Mattress. But in the center of the city, independent mattress shops rule, and can be a very smart source for budget shoppers looking to land a bargain. If you’re not in a rush to get a new mattress, you can score a bargain by waiting until American Furniture Outlet (1025 E Missouri Ave) opens. This large furniture, appliance and mattresses emporium is open for business just 10 days per month, which reduces the store’s overhead and allows American Furniture Outlet to pass along significant savings on brands like Serta, Coaster, and Acme. Along with an affordable mattress, shoppers can pick up a traditional of adjustable bed, bedroom furniture, bedding and pillows. Nearby, Mena Mattress (3014 Magoffin) and Sun City Mattress (1614 Texas Ave) are smaller, no-frills, mom-and-pop mattress shops with low prices and good selection. A few national chains have established a presence in North El Paso. The area is home to two locations of Mattress Firm, the nation’s most popular mattress chain. There’s Mattress Firm North Hills Crossing (10771 Gateway S Blvd) and Mattress Firm El Paso North (4535 Woodrow Bean Transmountain Dr). This company is known for having knowledgeable sales associates, who are trained to diagnose sleep issues, such as inadequate lumbar support, and guide shoppers to mattresses that will improve their rest and comfort. Reviewers like that sales reps work within their budgets without rushing or upselling them. The store’s huge selection includes all the top brands, like Sealy, Serta and Tempur-Pedic, and all sorts of specialty products, from gel memory foam, to hybrid mattresses and adjustable beds. The Mattress Store also has two locations in Northeast El Paso: The Mattress Store Dyer (9813 Dyer St #30), and just a couple of miles away, The Mattress Store Hondo Pass (9100 Dyer St). This local chain sells products from two top-shelf mattress brands: Kingsdown and SpringAir. The store’s BedMatch system is designed to match different types of mattress requirements (such as side sleeping, back pain, and couples with different preferences) with different types of specialized support. Each mattress in the store is labeled according to the color-coded BedMatch system, making it easier for customers to find a comfort match. The mattress store in El Paso south with the highest number of positive reviews is Denver Mattress Company (11835 Gateway Blvd W). Like Mattress Firm, this national chain sells leading mattress brands, and carries a wide selection of specialty beds, including cooling gel foam, innerspring, hybrid, latex, organic and individual coils. Denver Mattress Company also manufactures their own brand of high-quality, low-cost mattresses, “Doctor’s Choice,” which come in a variety of models. Reviewers give big points to the store’s customer service, saying that staff are knowledgeable and friendly, and provide a laid-back shopping experience with no sales pressure. For every mattress sold, the store also makes a donation to a global clean drinking water charity. Another reliable national chain store in the area with consistently great reviews is Mattress Firm, which has two locations in South El Paso: Mattress Firm The Americas (115 S Americas Ave) and Mattress Firm El Paso Southeast (1325 George Dieter Dr). Customers praise the customer service and wide selections available at both locations. Still another chain mattress store in the area is American Freight Furniture and Mattress (11330 James Watt Dr). This furniture and mattress store carries overstock, discontinued and liquidation inventory at highly affordable prices, and reviewers rave about scoring mattresses at closeout prices. The store stocks top brands like NordicRest and Simmons, but the models available at any given time vary greatly, as the inventory changes frequently. There are plenty of places to buy a mattress in El Paso to the East, including Mattress Firm El Paso East (1886 Joe Battle Blvd), Mattress Plus (Joe Battle Blvd), Sleep Savvy (1201 Airway Blvd), Shorty’s Mattress Depot (1742 North Zaragoza Road), and America’s Mattress (12211 Montwood Drive). Of these, the highest reviews go to Shorty’s Mattress Depot, which carries a variety of mattresses by BeautyRest and SpringAir. Those with sleep issues, such as overheating, insomnia, snoring or back pain, will appreciate the selection of specialty beds available, which include memory foam, plush, pillow top, adjustable beds, and even digital sleep monitors to track and improve rest patterns. Shorty’s warehouse-style business keeps costs low and allows the store to sell highly affordable mattresses; the store promises to match any advertised price in the area. Another well-reviewed option in East El Paso is America’s Mattress (12211 Montwood Drive). This chain store is part of the America’s Furniture brand, and customers shopping for a mattress can browse for furniture in the same store. American Mattress sells popular models by Serta, along with adjustable beds. American’s Mattress also manufactures an in-house brand of mattress with value in mind, which is available in a number of models, such as all-foam, continuous coil designs, and individually wrapped coils. The store offers free delivery, and has a generous one-year lowest-price-guarantee; bring in a lower advertised price, and you’ll receive a full refund of the difference, plus 10%.